I have been a critic of the Federal Trade Commission’s investigation into Google since it was a gleam in its competitors’ eyes—skeptical that there was any basis for a case, and concerned about the effect on consumers, innovation and investment if a case were brought. While it took the Commission more than a year and a half to finally come to the same conclusion, ultimately the FTC had no choice but to close the case that was a “square peg, round hole” problem from the start. Now that the FTC’s investigation has concluded, an examination of the nature of the markets in which Google operates illustrates why this crusade was ill-conceived from the start. In short, the “realities on the ground” strongly challenged the logic and relevance of many of the claims put forth by Google’s critics. Nevertheless, the politics are such that their nonsensical claims continue, in different forums, with competitors continuing to hope that they can wrangle a regulatory solution to their competitive problem. The case against Google rested on certain assumptions about the functioning of the markets in which Google operates. Because these are tech markets, constantly evolving and complex, most assumptions about the scope of these markets and competitive effects within them are imperfect at best. But there are some attributes of Google’s markets—conveniently left out of the critics’ complaints— that, properly understood, painted a picture for the FTC that undermined the basic, essential elements of an antitrust case against the company. That case was seriously undermined by the nature and extent of competition in the markets the FTC was investigating. Most importantly, casual references to a “search market” and “search advertising market” aside, Google actually competes in the market for targeted eyeballs: a market aimed to offer up targeted ads to interested users. Search offers a valuable opportunity for targeting an advertiser’s message, but it is by no means alone: there are myriad (and growing) other mechanisms to access consumers online. Consumers use Google because they are looking for information — but there are lots of ways to do that. There are plenty of apps that circumvent Google, and consumers are increasingly going to specialized sites to find what they are looking for. The search market, if a distinct one ever existed, has evolved into an online information market that includes far more players than those who just operate traditional search engines. We live in a world where what prevails today won’t prevail tomorrow. The tech industry is constantly changing, and it is the height of folly (and a serious threat to innovation and consumer welfare) to constrain the activities of firms competing in such an environment by pigeonholing the market. In other words, in a proper market, Google looks significantly less dominant. More important, perhaps, as search itself evolves, and as Facebook, Amazon and others get into the search advertising game, Google’s strong position even in the overly narrow “search market” is far from unassailable. Another common refrain from Google’s critics was that Google’s access to immense amounts of data used to increase the quality of its targeting presented a barrier to competition that no one else could match, thus protecting Google’s unassailable monopoly. But scale comes in lots of ways. Even if scale doesn’t come cheaply, the fact that challenging firms might have to spend the same (or, in this case, almost certainly less) Google did in order to replicate its success is not a “barrier to entry” that requires an antitrust remedy. Data about consumer interests is widely available (despite efforts to reduce the availability of such data in the name of protecting “privacy”—which might actually create barriers to entry). It’s never been the case that a firm has to generate its own inputs for every product it produces — and there’s no reason to suggest search or advertising is any different. Additionally, to defend a claim of monopolization, it is generally required to show that the alleged monopolist enjoys protection from competition through barriers to entry. In Google’s case, the barriers alleged were illusory. Bing and other recent entrants in the general search business have enjoyed success precisely because they were able to obtain the inputs (in this case, data) necessary to develop competitive offerings. Meanwhile unanticipated competitors like Facebook, Amazon, Twitter and others continue to knock at Google’s metaphorical door, all of them entering into competition with Google using data sourced from creative sources, and all of them potentially besting Google in the process. Consider, for example, Amazon’s recent move into the targeted advertising market, competing with Google to place ads on websites across the Internet, but with the considerable advantage of being able to target ads based on searches, or purchases, a user has made on Amazon—the world’s largest product search engine. Now that the investigation has concluded, we come away with two major findings. First, the online information market is dynamic, and it is a fool’s errand to identify the power or significance of any player in these markets based on data available today — data that is already out of date between the time it is collected and the time it is analyzed. Second, each development in the market – whether offered by Google or its competitors and whether facilitated by technological change or shifting consumer preferences – has presented different, novel and shifting opportunities and challenges for companies interested in attracting eyeballs, selling ad space and data, earning revenue and obtaining market share. To say that Google dominates “search” or “online advertising” missed the mark precisely because there was simply nothing especially antitrust-relevant about either search or online advertising. Because of their own unique products, innovations, data sources, business models, entrepreneurship and organizations, all of these companies have challenged and will continue to challenge the dominant company — and the dominant paradigm — in a shifting and evolving range of markets. But there are others in this sadly politicized mess for whom neither the facts nor the FTC’s extensive investigation process (nor the finer points of antitrust law) are enough. Like my four-year-old daughter, they just “want what they want,” and they will stamp their feet until they get it. As a believer in the pursuit of self-interest in a competitive capitalist system, I can’t blame a businessman who goes to Washington and tries to get special privileges for his company.… Blame the rest of us for being so foolish as to let him get away with it. I do blame businessmen when, in their political activities, individual businessmen and their organizations take positions that are not in their own self-interest and that have the effect of undermining support for free private enterprise. In that respect, businessmen tend to be schizophrenic. When it comes to their own businesses, they look a long time ahead, thinking of what the business is going to be like 5 to 10 years from now. But when they get into the public sphere and start going into the problems of politics, they tend to be very shortsighted. Is it really in the self-interest of Silicon Valley to set the government on Microsoft? Your industry, the computer industry, moves so much more rapidly than the legal process, that by the time this suit is over, who knows what the shape of the industry will be.… [Y]ou will rue the day when you called in the government. Among Microsoft’s chief tormentors was Gary Reback. He’s spent the last few years beating the drum against Google—but singing from the same song book. Reback recently told the Washington Post, “if a settlement were to be proposed that didn’t include search, the institutional integrity of the FTC would be at issue.” Actually, no it wouldn’t. As a matter of fact, the opposite is true. It’s hard to imagine an agency under more pressure, from more quarters (including the Hill), to bring a case around search. Doing so would at least raise the possibility that it were doing so because of pressure and not the merits of the case. But not doing so in the face of such pressure? That can almost only be a function of institutional integrity. [The FTC has] really put [itself] in the position where they are better positioned now than any other agency in the U.S. is likely to be in the immediate future to address these issues. I would encourage them to take the issues as seriously as they can. To the extent that they concur that Google has violated the law, there are very good reasons to try to address the concerns as quickly as possible. As Barnett acknowledges, there is no question that the FTC investigated these issues more fully than anyone. The agency’s institutional culture and its committed personnel, together with political pressure, media publicity and endless competitor entreaties, virtually ensured that the FTC took the issues “as seriously as they [could]” – in fact, as seriously as anyone else in the world. There is simply no reasonable way to criticize the FTC for being insufficiently thorough in its investigation and conclusions. They can darn well bring [a case] as a private antitrust action if they think their ox is being gored instead of free-riding on the government to achieve the same result. Competitors have already beaten a path to the DOJ’s door, and investigations are still pending in the EU, Argentina, several US states, and elsewhere. That the agency that has leveled the fullest and best-informed investigation has concluded that there is no “there” there should give these authorities pause, but, sadly for consumers who would benefit from an end to competitors’ rent seeking, nothing the FTC has done actually prevents courts or other regulators from having a crack at Google. The case against Google has received more attention from the FTC than the merits of the case ever warranted. It is time for Google’s critics and competitors to move on. Is Google Search Bias Consistent with Anticompetitive Foreclosure? In my series of three posts (here, here and here) drawn from my empirical study on search bias I have examined whether search bias exists, and, if so, how frequently it occurs. This, the final post in the series, assesses the results of the study (as well as the Edelman & Lockwood (E&L) study to which it responds) to determine whether the own-content bias I’ve identified is in fact consistent with anticompetitive foreclosure or is otherwise sufficient to warrant antitrust intervention. As I’ve repeatedly emphasized, while I refer to differences among search engines’ rankings of their own or affiliated content as “bias,” without more these differences do not imply anticompetitive conduct. It is wholly unsurprising and indeed consistent with vigorous competition among engines that differentiation emerges with respect to algorithms. However, it is especially important to note that the theories of anticompetitive foreclosure raised by Google’s rivals involve very specific claims about these differences. Properly articulated vertical foreclosure theories proffer both that bias is (1) sufficient in magnitude to exclude Google’s rivals from achieving efficient scale, and (2) actually directed at Google’s rivals. Unfortunately for search engine critics, their theories fail on both counts. The observed own-content bias appears neither to be extensive enough to prevent rivals from gaining access to distribution nor does it appear to target Google’s rivals; rather, it seems to be a natural result of intense competition between search engines and of significant benefit to consumers. Vertical foreclosure arguments are premised upon the notion that rivals are excluded with sufficient frequency and intensity as to render their efforts to compete for distribution uneconomical. Yet the empirical results simply do not indicate that market conditions are in fact conducive to the types of harmful exclusion contemplated by application of the antitrust laws. Rather, the evidence indicates that (1) the absolute level of search engine “bias” is extremely low, and (2) “bias” is not a function of market power, but an effective strategy that has arisen as a result of serious competition and innovation between and by search engines. The first finding undermines competitive foreclosure arguments on their own terms, that is, even if there were no pro-consumer justifications for the integration of Google content with Google search results. The second finding, even more importantly, reveals that the evolution of consumer preferences for more sophisticated and useful search results has driven rival search engines to satisfy that demand. Both Bing and Google have shifted toward these results, rendering the complained-of conduct equivalent to satisfying the standard of care in the industry–not restraining competition. A significant lack of search bias emerges in the representative sample of queries. This result is entirely unsurprising, given that bias is relatively infrequent even in E&L’s sample of queries specifically designed to identify maximum bias. In the representative sample, the total percentage of queries for which Google references its own content when rivals do not is even lower—only about 8%—meaning that Google favors its own content far less often than critics have suggested. This fact is crucial and highly problematic for search engine critics, as their burden in articulating a cognizable antitrust harm includes not only demonstrating that bias exists, but further that it is actually competitively harmful. As I’ve discussed, bias alone is simply not sufficient to demonstrate any prima facie anticompetitive harm as it is far more often procompetitive or competitively neutral than actively harmful. Moreover, given that bias occurs in less than 10% of queries run on Google, anticompetitive exclusion arguments appear unsustainable. How Much Search Bias Is There? My last two posts on search bias (here and here) have analyzed and critiqued Edelman & Lockwood’s small study on search bias. This post extends this same methodology and analysis to a random sample of 1,000 Google queries (released by AOL in 2006), to develop a more comprehensive understanding of own-content bias. As I’ve stressed, these analyses provide useful—but importantly limited—glimpses into the nature of the search engine environment. While these studies are descriptively helpful, actual harm to consumer welfare must always be demonstrated before cognizable antitrust injuries arise. And naked identifications of own-content bias simply do not inherently translate to negative effects on consumers (see, e.g., here and here for more comprehensive discussion). Now that’s settled, let’s jump into the results of the 1,000 random search query study. How Do Search Engines Rank Their Own Content? Consistent with our earlier analysis, a starting off point for thinking about measuring differentiation among search engines with respect to placing their own content is to compare how a search engine ranks its own content relative to how other engines place that same content (e.g. to compare how Google ranks “Google Maps” relative to how Bing or Blekko rank it). Restricting attention exclusively to the first or “top” position, I find that Google simply does not refer to its own content in over 90% of queries. 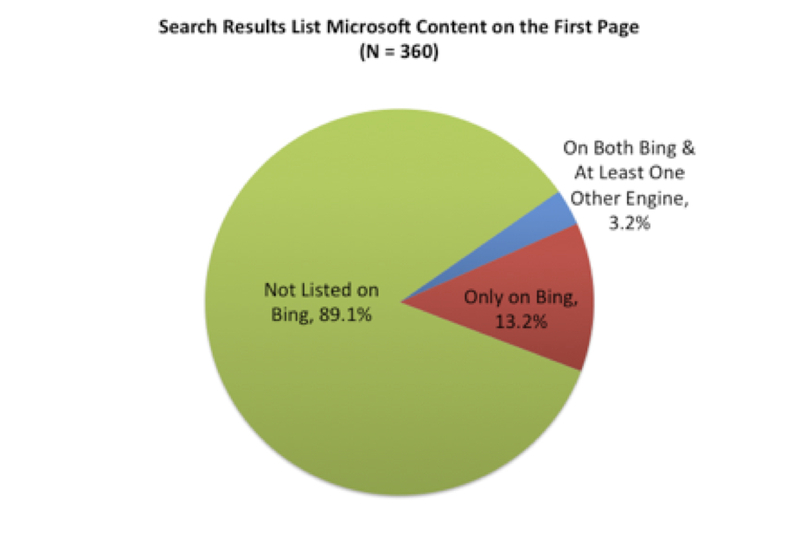 Similarly, Bing does not reference Microsoft content in 85.4% of queries. Google refers to its own content in the first position when other search engines do not in only 6.7% of queries; while Bing does so over twice as often, referencing Microsoft content that no other engine references in the first position in 14.3% of queries. 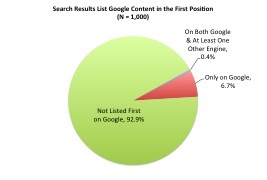 The following two charts illustrate the percentage of Google or Bing first position results, respectively, dedicated to own content across search engines. The most striking aspect of these results is the small fraction of queries for which placement of own-content is relevant. The results are similar when I expand consideration to the entire first page of results; interestingly, however, while the levels of own-content bias are similar considering the entire first page of results, Bing is far more likely than Google to reference its own content in its very first results position. Two distinct differences between the results of this larger study and my replication of Edelman & Lockwood emerge: (1) Google and Bing refer to their own content in a significantly smaller percentage of cases here than in the non-random sample; and (2) in general, when Google or Bing does rank its own content highly, rival engines are unlikely to similarly rank that same content. The following table reports the percentages of queries for which Google’s ranking of its own content and its rivals’ rankings of that same content differ significantly. When Google refers to its own content within its Top 5 results, at least one other engine similarly ranks this content for only about 5% of queries. The following table presents the likelihood that Google content will appear in a Google search, relative to searches conducted on rival engines (reported in odds ratios). 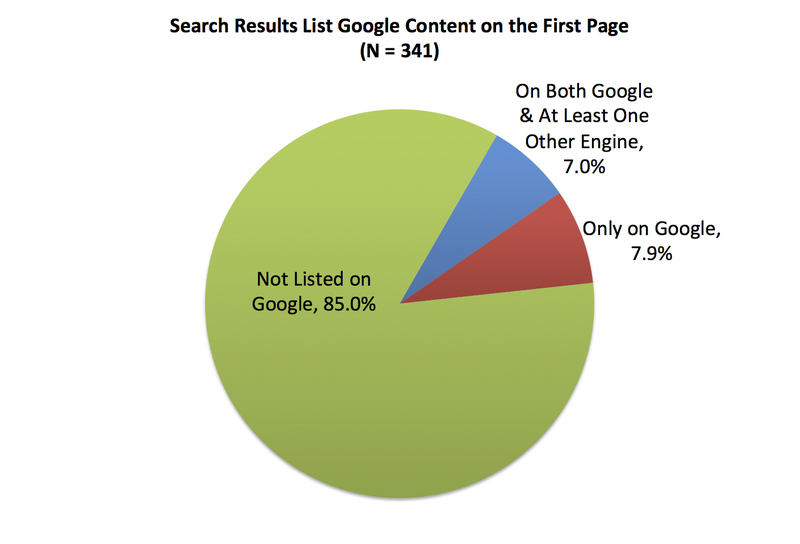 The first and third columns report results indicating that Google affiliated content is more likely to appear in a search executed on Google rather than rival engines. Google is approximately 16 times more likely to refer to its own content on its first page as is any other engine. Bing and Blekko are both significantly less likely to refer to Google content in their first result or on their first page than Google is to refer to Google content within these same parameters. In each iteration, Bing is more likely to refer to Google content than is Blekko, and in the case of the first result, Bing is much more likely to do so. Again, to be clear, the fact that Bing is more likely to rank its own content is not suggestive that the practice is problematic. Quite the contrary, the demonstration that firms both with and without market power in search (to the extent that is a relevant antitrust market) engage in similar conduct the correct inference is that there must be efficiency explanations for the practice. The standard response, of course, is that the competitive implications of a practice are different when a firm with market power does it. That’s not exactly right. It is true that firms with market power can engage in conduct that gives rise to potential antitrust problems when the same conduct from a firm without market power would not; however, when firms without market power engage in the same business practice it demands that antitrust analysts seriously consider the efficiency implications of the practice. In other words, there is nothing in the mantra that things are “different” when larger firms do them that undercut potential efficiency explanations. Regression analysis further illustrates Bing’s propensity to reference Microsoft content that rivals do not. The following table reports the likelihood that Microsoft content is referred to in a Bing search as compared to searches on rival engines (again reported in odds ratios). Bing refers to Microsoft content in its first results position about 56 times more often than rival engines refer to Microsoft content in this same position. Across the entire first page, Microsoft content appears on a Bing search about 25 times more often than it does on any other engine. Both Google and Blekko are accordingly significantly less likely to reference Microsoft content. 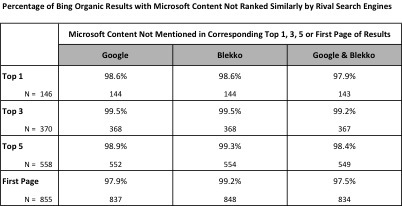 Notice further that, contrary to the findings in the smaller study, Google is slightly less likely to return Microsoft content than is Blekko, both in its first results position and across its entire first page. Consistent with the smaller sample, I find again that Bing is more biased than Google using these metrics. In other words, Bing ranks its own content significantly more highly than its rivals do more frequently then Google does, although the discrepancy between the two engines is smaller here than in the study of Edelman & Lockwood’s queries. 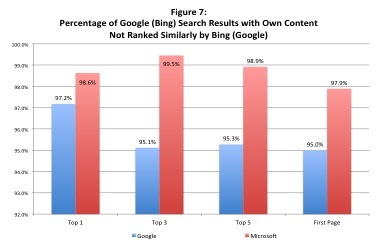 As noted above, Bing is over twice as likely to refer to own content in first results position than is Google. Figures 7 and 8 present the same data reported above, but with Blekko removed, to allow for a direct visual comparison of own-content bias between Google and Bing. Consistent with my earlier results, Bing appears to consistently rank Microsoft content higher than Google ranks the same (Microsoft) content more frequently than Google ranks Google content more prominently than Bing ranks the same (Google) content. This result is particularly interesting given the strength of the accusations condemning Google for behaving in precisely this way. That Bing references Microsoft content just as often as—and frequently even more often than!—Google references its own content strongly suggests that this behavior is a function of procompetitive product differentiation, and not abuse of market power. But I’ll save an in-depth analysis of this issue for my next post, where I’ll also discuss whether any of the results reported in this series of posts support anticompetitive foreclosure theories or otherwise suggest antitrust intervention is warranted. In my last post, I discussed Edelman & Lockwood’s (E&L’s) attempt to catch search engines in the act of biasing their results—as well as their failure to actually do so. In this post, I present my own results from replicating their study. Unlike E&L, I find that Bing is consistently more biased than Google, for reasons discussed further below, although neither engine references its own content as frequently as E&L suggest. I ran searches for E&L’s original 32 non-random queries using three different search engines—Google, Bing, and Blekko—between June 23 and July 5 of this year. This replication is useful, as search technology has changed dramatically since E&L recorded their results in August 2010. Bing now powers Yahoo, and Blekko has had more time to mature and enhance its results. Blekko serves as a helpful “control” engine in my study, as it is totally independent of Google and Microsoft, and so has no incentive to refer to Google or Microsoft content unless it is actually relevant to users. In addition, because Blekko’s model is significantly different than Google and Microsoft’s, if results on all three engines agree that specific content is highly relevant to the user query, it lends significant credibility to the notion that the content places well on the merits rather than being attributable to bias or other factors. Focusing solely upon the first position, Google refers to its own products or services when no other search engine does in 21.9% of queries; in another 21.9% of queries, both Google and at least one other search engine rival (i.e. Bing or Blekko) refer to the same Google content with their first links. But restricting focus upon the first position is too narrow. Assuming that all instances in which Google or Bing rank their own content first and rivals do not amounts to bias would be a mistake; such a restrictive definition would include cases in which all three search engines rank the same content prominently—agreeing that it is highly relevant—although not all in the first position. This evidence indicates that Google’s ranking of its own content differs significantly from its rivals in only 7.9% of queries, and that when Google ranks its own content prominently it is generally perceived as relevant. 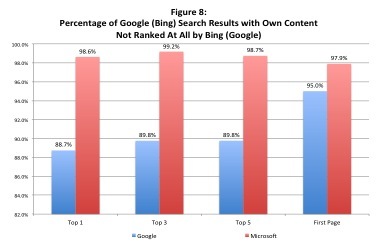 Further, these results suggest that Bing’s organic search results are significantly more biased in favor of Microsoft content than Google’s search results are in favor of Google’s content. The following table presents the percentages of queries for which Google’s ranking of its own content differs significantly from its rivals’ ranking of that same content. Note that percentages below 50 in this table indicate that rival search engines generally see the referenced Google content as relevant and independently believe that it should be ranked similarly. So when Google ranks its own content highly, at least one rival engine typically agrees with this ranking; for example, when Google places its own content in its Top 3 results, at least one rival agrees with this ranking in over 70% of queries. Bing especially agrees with Google’s rankings of Google content within its Top 3 and 5 results, failing to include Google content that Google ranks similarly in only a little more than a third of queries. This table illustrates the significant discrepancies between Bing’s treatment of its own Microsoft content relative to Google and Blekko. Neither rival engine refers to Microsoft content Bing ranks within its Top 3 results; Google and Blekko do not include any Microsoft content Bing refers to on the first page of results in nearly 80% of queries. Moreover, Bing frequently ranks Microsoft content highly even when rival engines do not refer to the same content at all in the first page of results. For example, of the 5 queries for which Bing ranks Microsoft content in its top result, Google refers to only one of these 5 within its first page of results, while Blekko refers to none. Even when comparing results across each engine’s full page of results, Google and Blekko only agree with Bing’s referral of Microsoft content in 20.4% of queries. 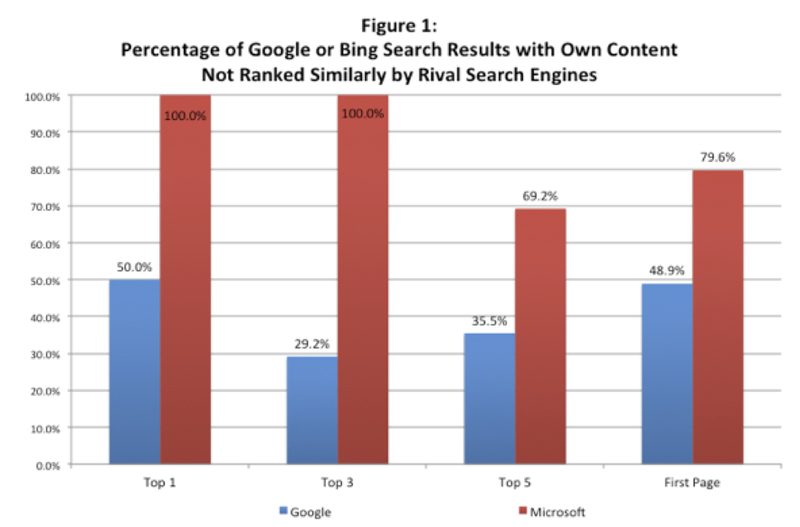 Although there are not enough Bing data to test results in the first position in E&L’s sample, Microsoft content appears as results on the first page of a Bing search about 7 times more often than Microsoft content appears on the first page of rival engines. 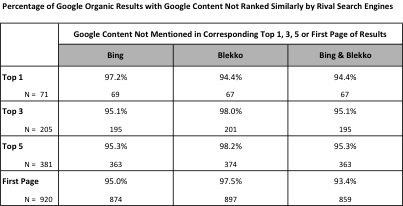 Also, Google is much more likely to refer to Microsoft content than Blekko, though both refer to significantly less Microsoft content than Bing. On E&L’s own terms, Bing results are more biased than Google results; rivals are more likely to agree with Google’s algorithmic assessment (than with Bing’s) that its own content is relevant to user queries. Bing refers to Microsoft content other engines do not rank at all more often than Google refers its own content without any agreement from rivals. Figures 1 and 2 display the same data presented above in order to facilitate direct comparisons between Google and Bing. As Figures 1 and 2 illustrate, Bing search results for these 32 queries are more frequently “biased” in favor of its own content than are Google’s. The bias is greatest for the Top 1 and Top 3 search results. My study finds that Bing exhibits far more “bias” than E&L identify in their earlier analysis. For example, in E&L’s study, Bing does not refer to Microsoft content at all in its Top 1 or Top 3 results; moreover, Bing refers to Microsoft content within its entire first page 11 times, while Google and Yahoo refer to Microsoft content 8 and 9 times, respectively. Most likely, the significant increase in Bing’s “bias” differential is largely a function of Bing’s introduction of localized and personalized search results and represents serious competitive efforts on Bing’s behalf. Again, it’s important to stress E&L’s limited and non-random sample, and to emphasize the danger of making strong inferences about the general nature or magnitude of search bias based upon these data alone. However, the data indicate that Google’s own-content bias is relatively small even in a sample collected precisely to focus upon the queries most likely to generate it. In fact—as I’ll discuss in my next post—own-content bias occurs even less often in a more representative sample of queries, strongly suggesting that such bias does not raise the competitive concerns attributed to it. Last week I linked to my new study on “search bias.” At the time I noted I would have a few blog posts in the coming days discussing the study. This is the first of those posts. A lot of the frenzy around Google turns on “search bias,” that is, instances when Google references its own links or its own content (such as Google Maps or YouTube) in its search results pages. Some search engine critics condemn such references as inherently suspect and almost by their very nature harmful to consumers. Yet these allegations suffer from several crucial shortcomings. As I’ve noted (see, e.g., here and here), these naked assertions of discrimination are insufficient to state a cognizable antitrust claim, divorced as they are from consumer welfare analysis. Indeed, such “discrimination” (some would call it “vertical integration”) has a well-recognized propensity to yield either pro-competitive or competitively neutral outcomes, rather than concrete consumer welfare losses. Moreover, because search engines exist in an incredibly dynamic environment, marked by constant innovation and fierce competition, we would expect different engines, utilizing different algorithms and appealing to different consumer preferences, to emerge. So when search engines engage in product differentiation of this sort, there is no reason to be immediately suspicious of these business decisions. No reason to be immediately suspicious – but there could, conceivably, be a problem. If there is, we would want to see empirical evidence of it—of both the existence of bias, as well as the consumer harm emanating from it. But one of the most notable features of this debate is the striking lack of empirical data. Surprisingly little research has been done in this area, despite frequent assertions that own-content bias is commonly practiced and poses a significant threat to consumers (see, e.g., here). My paper is an attempt to rectify this. In the paper, I investigate the available data to determine whether and to what extent own-content bias actually occurs, by analyzing and replicating a study by Ben Edelman and Ben Lockwood (E&L) and conducting my own study of a larger, randomized set of search queries. In this post I discuss my analysis and critique of E&L; in future posts I’ll present my own replication of their study, as well as the results of my larger study of 1,000 random search queries. Finally, I’ll analyze whether any of these findings support anticompetitive foreclosure theories or are otherwise sufficient to warrant antitrust intervention. E&L “investigate . . . [w]hether search engines’ algorithmic results favor their own services, and if so, which search engines do most, to what extent, and in what substantive areas.” Their approach is to measure the difference in how frequently search engines refer to their own content relative to how often their rivals do so. It’s not hard to see why search engine result differ at all. Search engines each use their own “algorithm” to cull through the pages they’ve collected from across the web, to decide which pages to rank first . . . . Google has a different algorithm than Bing. In short, Google will have a different opinion than Bing. Opinions in the search world, as with the real world, don’t always agree. Moreover, this assertion completely discounts both the vigorous competitive product differentiation that occurs in nearly all modern product markets as well as the obvious selection effects at work in own-content bias (Google users likely prefer Google content). This combination detaches E&L’s analysis from the consumer welfare perspective, and thus antitrust policy relevance, despite their claims to the contrary (and the fact that their results actually exhibit very little bias). Several methodological issues undermine the policy relevance of E&L’s analysis. First, they hand select 32 search queries and execute searches on Google, Bing, Yahoo, AOL and Ask. This hand-selected non-random sample of 32 search queries cannot generate reliable inferences regarding the frequency of bias—a critical ingredient to understanding its potential competitive effects. Indeed, E&L acknowledge their queries are chosen precisely because they are likely to return results including Google content (e.g., email, images, maps, video, etc.). E&L analyze the top three organic search results for each query on each engine. They find that 19% of all results across all five search engines refer to content affiliated with one of them. They focus upon the first three organic results and report that Google refers to its own content in the first (“top”) position about twice as often as Yahoo and Bing refer to Google content in this position. Additionally, they note that Yahoo is more biased than Google when evaluating the first page rather than only the first organic search result. E&L also offer a strained attempt to deal with the possibility of competitive product differentiation among search engines. They examine differences among search engines’ references to their own content by “compar[ing] the frequency with which a search engine links to its own pages, relative to the frequency with which other search engines link to that search engine’s pages.” However, their evidence undermines claims that Google’s own-content bias is significant and systematic relative to its rivals’. In fact, almost zero evidence of statistically significant own-content bias by Google emerges. E&L find, in general, Google is no more likely to refer to its own content than other search engines are to refer to that same content, and across the vast majority of their results, E&L find Google search results are not statistically more likely to refer to Google content than rivals’ search results. The same data can be examined to test the likelihood that a search engine will refer to content affiliated with a rival search engine. Rather than exhibiting bias in favor of an engine’s own content, a “biased” search engine might conceivably be less likely to refer to content affiliated with its rivals. The table below reports the likelihood (in odds ratios) that a search engine’s content appears in a rival engine’s results. The first two columns of the table demonstrate that both Google and Yahoo content are referred to in the first search result less frequently in rivals’ search results than in their own. 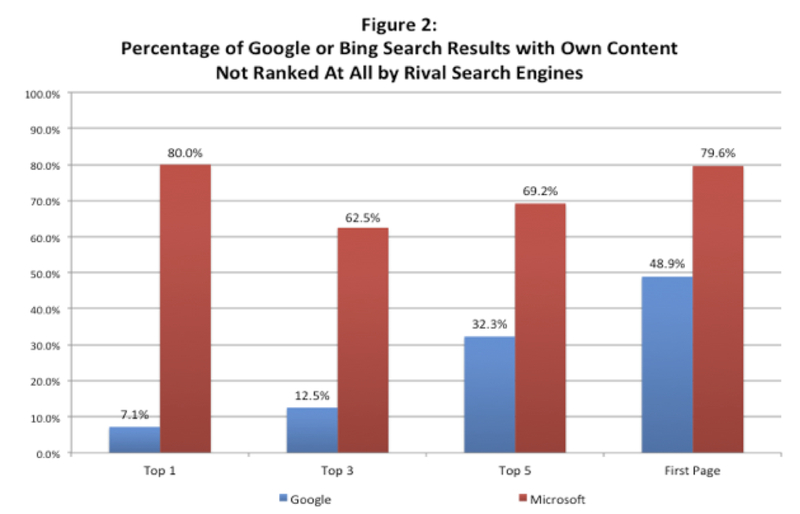 Although Bing does not have enough data for robust analysis of results in the first position in E&L’s original analysis, the next three columns in Table 1 illustrate that all three engines’ (Google, Yahoo, and Bing) content appears less often on the first page of rivals’ search results than on their own search engine. However, only Yahoo’s results differ significantly from 1. As between Google and Bing, the results are notably similar. E&L also make a limited attempt to consider the possibility that favorable placement of a search engine’s own content is a response to user preferences rather than anticompetitive motives. Using click-through data, they find, unsurprisingly, that the first search result tends to receive the most clicks (72%, on average). They then identify one search term for which they believe bias plays an important role in driving user traffic. For the search query “email,” Google ranks its own Gmail first and Yahoo Mail second; however, E&L also find that Gmail receives only 29% of clicks while Yahoo Mail receives 54%. E&L claim that this finding strongly indicates that Google is engaging in conduct that harms users and undermines their search experience. However, from a competition analysis perspective, that inference is not sound. Indeed, the fact that the second-listed Yahoo Mail link received the majority of clicks demonstrates precisely that Yahoo was not competitively foreclosed from access to users. Taken collectively, E&L are not able to muster evidence of potential competitive foreclosure. While it’s important to have an evidence-based discussion surrounding search engine results and their competitive implications, it’s also critical to recognize that bias alone is not evidence of competitive harm. Indeed, any identified bias must be evaluated in the appropriate antitrust economic context of competition and consumers, rather than individual competitors and websites. E&L’s analysis provides a useful starting point for describing how search engines differ in their referrals to their own content. But, taken at face value, their results actually demonstrate little or no evidence of bias—let alone that the little bias they do find is causing any consumer harm. As I’ll discuss in coming posts, evidence gathered since E&L conducted their study further suggests their claims that bias is prevalent, inherently harmful, and sufficient to warrant antitrust intervention are overstated and misguided. The FTC Makes its Google Investigation Official, Now What? At Google, we’ve always focused on putting the user first. We aim to provide relevant answers as quickly as possible—and our product innovation and engineering talent have delivered results that users seem to like, in a world where the competition is only one click away. Still, we recognize that our success has led to greater scrutiny. Yesterday, we received formal notification from the U.S. Federal Trade Commission that it has begun a review of our business. We respect the FTC’s process and will be working with them (as we have with other agencies) over the coming months to answer questions about Google and our services. It’s still unclear exactly what the FTC’s concerns are, but we’re clear about where we stand. Since the beginning, we have been guided by the idea that, if we focus on the user, all else will follow. No matter what you’re looking for—buying a movie ticket, finding the best burger nearby, or watching a royal wedding—we want to get you the information you want as quickly as possible. Sometimes the best result is a link to another website. Other times it’s a news article, sports score, stock quote, a video or a map. It is too early to know the precise details of the FTC’s interest. However, We’ve been discussing various aspects of the investigation here at TOTM for the last year. Indeed, we’ve written two articles focused upon framing and evaluating a potential antitrust case against Google as well as the misguided attempts to use the antitrust laws to impose “search neutrality.” We’ve also written a number of blog posts on Google and antitrust (see here for an archive). For several reasons, the Federal Trade Commission’s investigation into Google’s business practices seems misguided from the perspective of competition policy directed toward protecting consumer welfare. We hope and expect that the agency will conclude its investigation quickly and without any enforcement action against the company. But it is important to note that this is merely an investigation–and at that, one that is not necessarily new. More importantly, it is not a full-fledged enforcement action, much less a successful one; and although such investigations are extraordinarily costly for their targets, there is not yet (and there may never be) even any allegation of liability inherent in an investigation. In any such case, the focus of concern must always be on consumer harm–not harm to certain competitors. This is a well known antitrust maxim, but it is certainly appropriately applied here. We are skeptical that consumer harm is present in this case, and our writings have explored this issue at length. In brief, Google of today is not the Microsoft of 1998, and the issues and circumstances that gave rise to liability in the Microsoft case are uniformly absent here. Related, most of the claims we have seen surrounding Google’s conduct here are of the vertical sort–where Google has incorporated (either by merger, business development or technological development) and developed new products or processes to evolve its basic search engine in novel ways by, for instance, offering results in the form of maps or videos, or integrating travel-related search results into its traditional offerings. As we’ve written, these sorts of vertical activities are almost always pro-competitive, despite claims to the contrary by aggrieved competitors, and we should confront such claims with extreme skepticism. Vertical claims instigated by rivals are historically viewed with skepticism in antitrust circles. Failing to subject these claims to scrutiny focused on consumer welfare risks would be a mistake whose costs would be borne largely by consumers. The fact that Google’s rivals–including most importantly Microsoft itself–are complaining about the company is, ironically, some of the very best evidence that Google’s practices are in fact pro-consumer and pro-competitive. It is always problematic when competitors use the regulatory system to try to hamstring their rivals, and we should be extremely wary of claims arising from such conduct. We are also troubled by statements emanating from FTC Commissioners suggesting that the agency intends to pursue this case as a so-called “Section 5” case rather than the more traditional “Section 2” case. We will have to wait to see whether any complaint is actually brought and, if so, under what statutory authority, but a Section 5 case against Google raises serious concerns about effective and efficient antitrust enforcement. Commissioner Rosch has claimed that Section 5 could address conduct that has the effect of “reducing consumer choice”—an effect that some commentators support without requiring any evidence that the conduct actually reduces consumer welfare. Troublingly, “reducing consumer choice” seems to be a euphemism for “harm to competitors, not competition,” where the reduction in choice is the reduction of choice of competitors who may be put out of business by pro-competitive behavior. This would portend an extremely problematic shift in direction for US antitrust law. Together Geoffrey Manne and Joshua Wright are the authors of two articles on the antitrust law and economics of Google and search engines more broadly, Google and the Limits of Antitrust: The Case Against the Case Against Google, and If Search Neutrality Is the Answer, What’s the Question? Manne is also the author of “The Problem of Search Engines as Essential Facilities: An Economic & Legal Assessment,” an essay debunking arguments for regulation of search engines to preserve so-called “search neutrality” in TechFreedom’s 2011 book, The Next Digital Decade: Essays on the Future of the Internet. Allegations of “search bias” have led to increased scrutiny of Google, including active investigations in the European Union and Texas, a possible FTC investigation, and sharply-worded inquiries from members of Congress. But what does “search bias” really mean? Does it demand preemptive “search neutrality” regulation, requiring government oversight of how search results are ranked? Is antitrust intervention required to protect competition? Or can market forces deal with these concerns? Prof. Geoffrey Manne, Lewis & Clark Law School, TechFreedom Adjunct Fellow, and Director of the International Center for Law & Economics, author of If Search Neutrality Is the Answer, What’s the Question?